In my weekly column, we take a long look at impact fantasy football rookies. I compare their performance to date against my original expectations of them. Let’s continue this 2014 version of the series by looking at the Browns dynamic rookie running back duo of 2014 third rounder Terrance West and free agent selection of Isaiah Crowell. Here is what I saw in college from West: This runner saw a lot of carries playing for little Towson College finishing with over 4,800 rushing yards and 84 touchdowns in a three-year career. The rookie back runs with a lot of power and uses his pad level to inflict pain on the defense. West has good patience and vision combined with quick feet to get to the hole quickly. The young runner doesn’t create much room for himself, but he takes what the defense opens up. He is dependable as the day is long, but is not very flashy. The biggest knock against him is that he hasn’t played against great competition with a lot of touches, so much of his fate will rest on with which team drafts him. This is what West did against the Saints: He was the unquestioned starter, which a few short weeks ago looked very improbable. This runner has good lower body strength and flows to where the called play dictates. His patience is better than most backs in their first year as he waits for the rushing lanes to open. There is very little improvisation in his game, if the play calls for the back to go off the left guard’s right hip, then that is exactly where West will pound the rock. He has quick feet, which aids him finding the cut back lane. West will occasionally surprise with a spin move or two, but does not have strong downfield vision or anticipation. He is a powerful, hard-nosed runner which is easy to see on his way to the end zone scoring his first NFL touchdown. In the passing game, West holds his own pass blocking, but catches the ball with his body. This hinders his effectiveness to play all three downs. I don’t believe he is a special runner, but that hasn’t stopped a player like St. Louis Ram Zac Stacy from being fantasy and NFL effective. West is a flex play right now in fantasy football. That role may grow into a RB2 in dynasty leagues, but his upside could as easily be stifled by his fellow rookie teammate Crowell. Here is what I saw on tape with Crowell in college: Crowell is one of his draft classes best inside runners and yet, could be one of his class’ biggest knuckleheads. Weapons charges and personal tragedies sidelined him after a great freshman season at Georgia, only to see him transfer to small Alabama State (an uncle was from the area and a high school friend was already on the team). 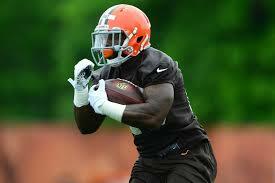 Speaking about him as a rusher, Crowell is quite talented. The back either lowers his shoulder pads to knock would-be tacklers down or gets small in the hole, making sure the runner is the lowest man. Crowell delivers a nice stiff-arm, smashing defenders with the same veracity as he takes the punishment. He has a sudden burst, always falling forward using his almost feline balance. Crowell reads his blockers, takes good angles and makes decisive cuts gaining extra yardage. He could be a top three back in his class or be out of the league before the end of the season. Against the Saints, this is what Crowell demonstrated: His first appearance was on a third down, which is a great way to prove his athleticism. He also split out at times in five wide receiver sets. As a pass protector, the rookie needs a lot of work, because he tends to get knocked back by blitzing defenders. Crowell never gave up though, which leaves room for improvement. The back is a natural hands catcher who glides between defenders with smooth running strides seeing the gridiron well. He has great burst to the outside and runs with plenty of power. There is a bit of nastiness to his game because Crowell loves to run over people and always falls forward. The rookie runner has good body control, starts and stops quickly, letting the defense fly right by him. West seems to be the more consistent back, but Crowell could break any play to the house. If I had to choose between the two, I would want West for 2014, but would rather have Crowell for the rest of his career in a dynasty league.